Yes, we're back. This time it's Sharp doing the presser honors. Once again, they've rolled out their uber-thin LCD for all to gaze upon. 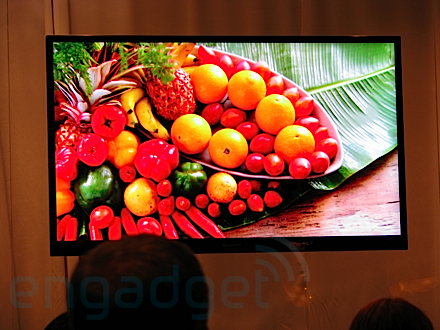 This time however, it's a 65-inch version with that same 1-inch thickness. Hoozah! Fortunately they have lunch for us. Unfortunately, we have no time to eat it in our tireless support (and pandering) to you dear reader. The smell of bologna can be overpowering. Things should get rolling here in a sec. 11:53am (PST) - Ugh, more food! 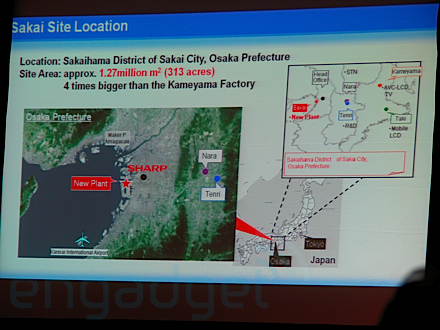 12:00am - Toshihiko Fujimoto, Chairman and CEO takes the stage. 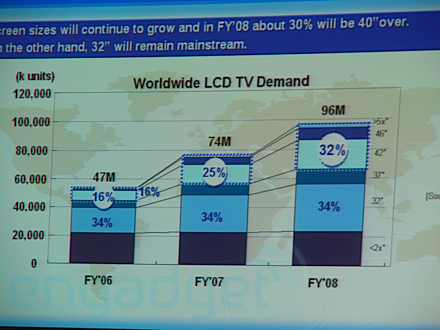 Running down the increased demand of LCDs. 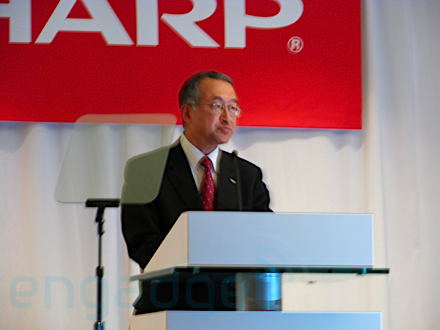 Fiscal year 2008, Sharp expects worldwide LCD TV demand to reach 96 million units for a 32% increase over 2007. 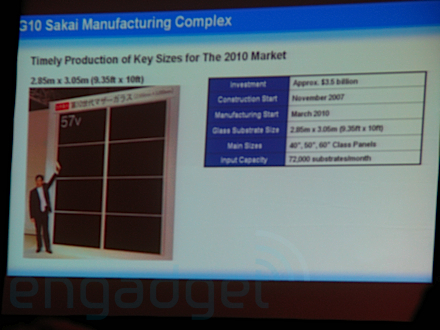 12:03am - Sharp's 108-inch LCD will be commercially available this year. 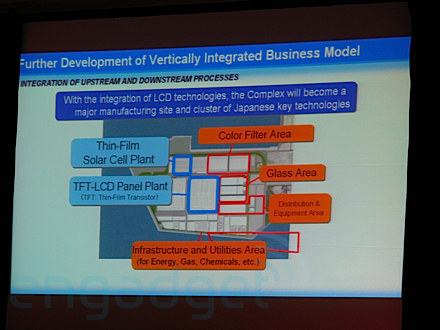 World's first 10th gen LCD plant coming on line as well. The first in the world. CEO now discussing the tech details of their LCD panel facilities which incidentally, produce solar cells due to the similarity in materials. Sharp is the world's largest producer of solar cells. Hey, is that a cookie? 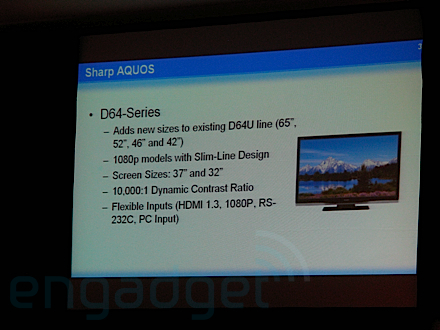 12:07am - The 65-inch diagonal, 1-inch thin TV at the front of the room features a 100,000:1 contrast. We believe it, that picture is absolutely stunning. No immediate plans to productize. 12:13am - 30 million units expected to ship in 2008 in the US alone. 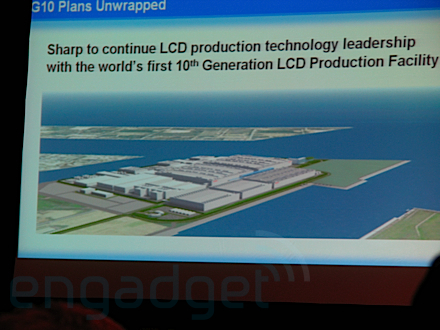 Sharp is exploring OLED technology, however, "OLED will not replace LCD anytime soon." This is due to two reasons. 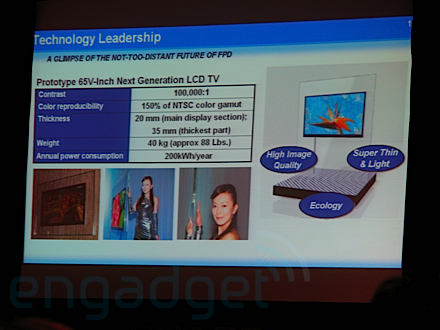 First, OLED has a 3 to 4 year lifespan when a 10 year lifespan is required from a TV. 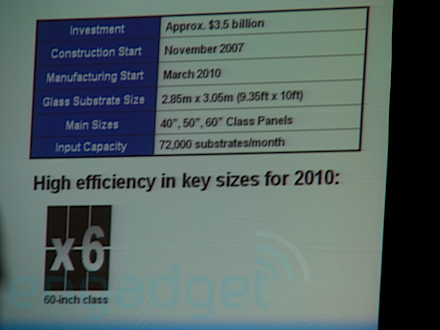 Second, OLED is too expensive to manufacture in large panel sizes. As such, Sharp will not produce OLED sets until this situation changes. So far, this feels like an analyst meeting, not a consumer electronics focused press event. 12:15am - Sharp will focus on bigger panels and the gaming community in the new year. They are also expanding the AQUOS Advantage member services program to ease setup and troubleshooting. Among other benefits, it moves first level service questions to Sharp, not dealers. They're getting more environmental too by reducing overall greenhouse gas emissions and entering into a Manufacturing Recycling Management (MRM) agreement with the likes of Toshiba and Panasonic. Make no doubt about it, being green is going to be a hot topic at this year's CES. 12:21am - Bob Scaglione, senior VP marketing jumps on stage. AQUOS Net features a "net" button for customized, web-based content accessible via the Ethernet jack on your AQUOS television. User configurable sidebar widgets from the likes of Weatherbug, NASDAQ, AQOUS gallery (1080p images) and more will be available in the next month with more to come in the future. AQUOS Advantage Live allows a networked advisor to provide interactive support including assisting in the connectivity of a Blu-ray player, FAQs, and access tp user manuals. 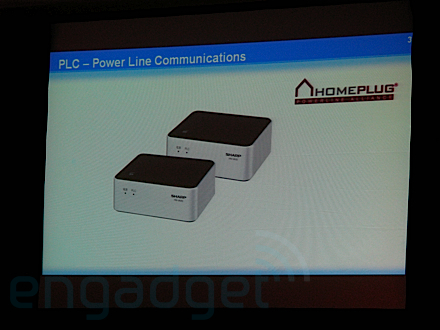 HomePlug AV-based PLC adapters will connect the TVs to home wiring for those without Ethernet. Of course, you can always get a WiFi to Ethernet adapter for the back of your set but we won't tell Sharp that and spoil the fun. 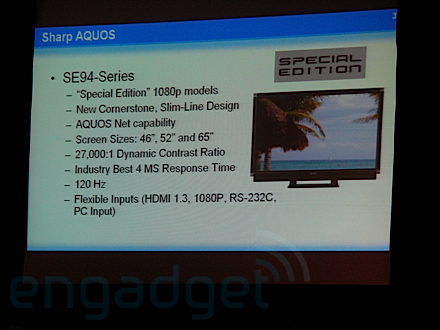 12:20am - The SE94 (SE as in "special edition") series will be available this month in 65 and 52-inch screen sizes. In February a 46-inch set will be available. All offer AQUOS Net connectivity. 28% slimmer and 14% lighter than previous sets. 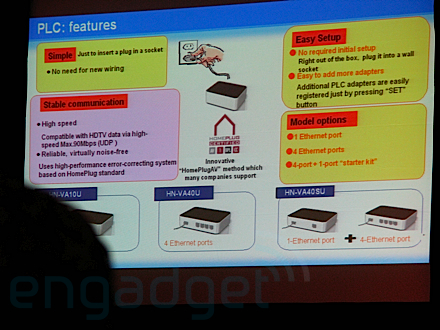 Features include a 27,000:1 contrast, 4ms repsonse, 3 HDMI 1.3, and a pair of component inputs. Also new are a pair of 37- and 32-inch D64-series sets and two 720p D44-series tubes in 37- and 32-inch sizes. 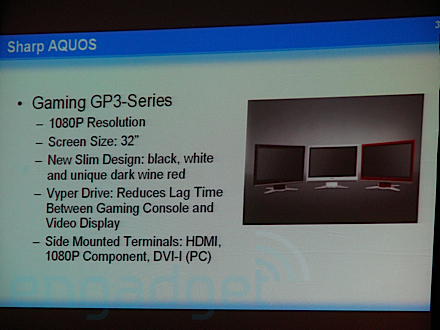 GP3-series of 1080p gaming sets including a 32-inch with Vyper Drive said to reduce lag time between gaming console and video display. 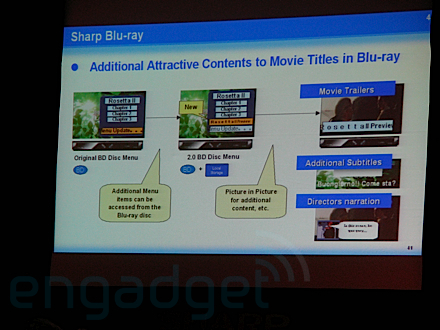 Sharp remains committed to Blu-ray. 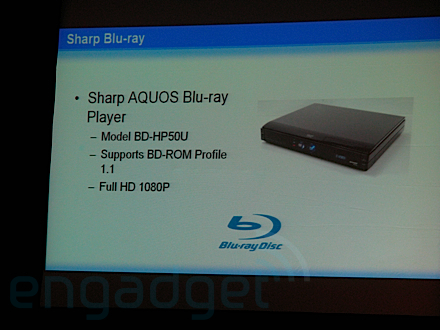 New BD-HP50U player with 1.1 profile support just announced. 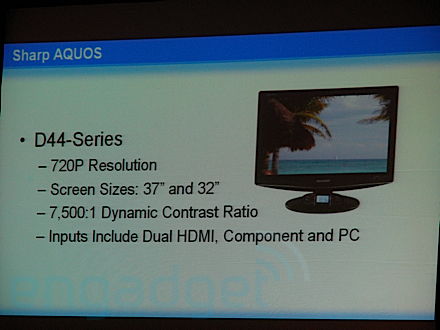 AQUOS Link enabled over HDMI for integration with the AQUOS TV. Also announced, are a few audio products including an iPod dock, shelf system, and theater rack system. 12:35 - And that's all she wrote.